Martha's weight gain has always been an issue; she was born 6lbs 1oz, she was only 5lbs13oz when we brought her home and every week until she turned 1 we had the Health Visitor over for a weekly weigh in. At her last weigh in she'd only just breached the 18lbs mark. Because of this we've kept her in the stage one rear facing car seat; she's 16 months old - which is double the age her brother and sister were when they moved up. But we've noticed that she hasn't been travelling well recently; she screams for entire car journeys which wasn't fun after a long day of shopping at the Trafford Centre or travelling home from visiting family in Liverpool over Christmas. We could only put it down to her being uncomfortable and bored. 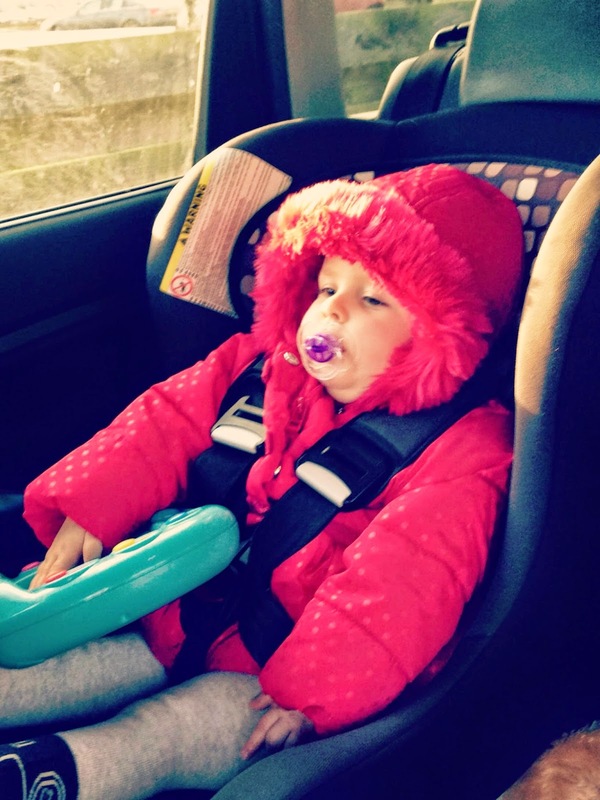 We decided to go to Llandudno shopping for the afternoon last Tuesday and thought this would be the perfect opportunity to try her in Isabella's car seat. Now it's a hell of a thing when your last baby moves up a stage in a car seat; evidence that she isn't a baby any more and keeping her in her first car seat won't change that. She was as good as gold the whole way there and back. She knew she was sitting in Isabella's car seat, she kept looking over at her big sister and laughing; she even managed a nap both ways. She didn't cry one. I didn't think to take my proper camera with me so apologies, this one is just off my iphone. But there's no going back now - my day's with a car seat that I can attach to the chassis of my pram are over!